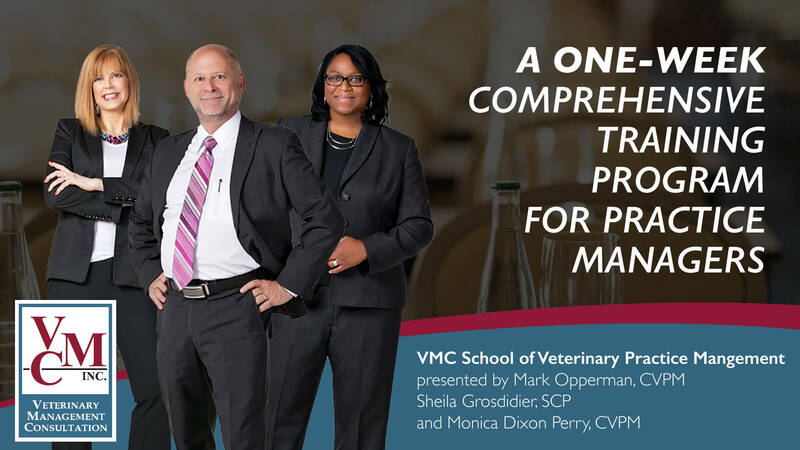 The VMC School of Veterinary Practice Management - Veterinary Management Consultation | VMC, Inc. Attend our comprehensive, practical, and intensive one-week course. Your take-away will be the foundational skills needed in the real-world situations veterinary clinics face. This unique and empowering school includes full access to our highly-qualified consultants. We utilize specific systems, procedures, techniques, and technology that are successfully used in thousands of practices around the globe. We will teach you how to make these methods effective in your practice. Our small class size provides an intimate learning environment, giving you ample time to discuss the material and share with your group. You'll get to network while you immerse yourself in an unforgettable learning experience. You'll get significant, long-term value from your investment: outstanding tools, impressive skills, and follow-up coaching that will support your practice and enrich your career. The $4,900 tuition for the school includes five full days of instruction, six months of follow-up coaching, course materials, all meals (except dinner) and a certificate of completion. A $3,000 deposit is required to guarantee registration for the course. Simply download the VMC School brochure and application above. Complete the application form and return to vmc@vmc-inc.com for review and approval. A comprehensive 300+ page workbook of notes, worksheets, templates and more! 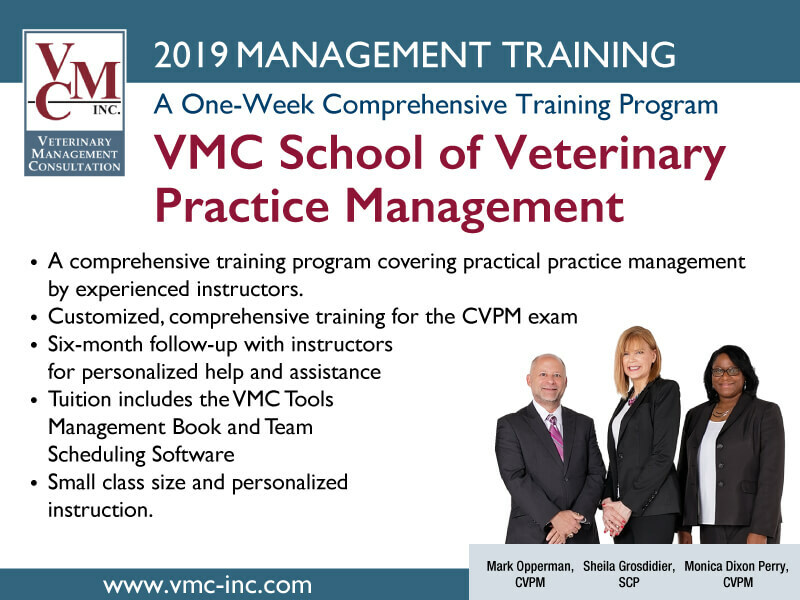 The course is eligible for 40 hours of continuing education (CE) credits toward your CVPM certification (VHMA-approved course ID 12-24). Upon completion, you'll have six months’ access to all instructors so that you can ask questions, discuss situations, review policies and protocols, or just review your progress. "Attending the VMC School is by far the best decision I have made in my Hospital Administration career. If you have experience or no experience in the field, you are going to walk away with tools to assist you and make you a better Administrator/Manager. The School provided me with practical tools to implement immediately and that I use daily. The Tools Binder, which includes Job Descriptions, Phase Training, and Evaluation forms and more are one of the many things I have found valuable from the School. Mark, Sheila and Monica are excellent instructors and they are available to consult with you beyond school in implementing the tools they have provided. Until someone experiences the week, I don't think they can wrap their mind around all that they learn in only five days! I would highly recommend the VMC School to others!"